We have shown that chronic administration of the Toll-like receptor 2 (TLR2) agonist Pam3CSK4 prevents diabetes in NOD mice by inducing TLR2 tolerance of dendritic cells (DCs). We have also reported that a novel dipeptidyl peptidase 4 (DPP4) inhibitor, DA-1229, could increase beta cell mass. Here we investigated whether a combination of DPP4 inhibition, with beneficial effects on beta cell mass, and TLR2 tolerisation, protecting beta cells from autoimmune destruction, could treat a model of established type 1 diabetes. Diabetic NOD mice were treated with 100 μg Pam3CSK4, administered three times a week for 3 weeks, in combination with feeding with chow containing 0.3% DA-1229. Beta cell mass and proliferation were studied by immunohistochemistry. DC tolerance was assessed by studying diabetogenic CD4+ T cell priming after adoptive transfer and expression of costimulatory molecules on DCs by flow cytometry. We observed reversal of diabetes in NOD mice by Pam3CSK4+DA-1229 but not by either Pam3CSK4 or DA-1229 alone. Beta cell mass and the number of proliferating beta cells were significantly enhanced by Pam3CSK4+DA-1229, but not by either Pam3CSK4 or DA-1229 alone. Diabetogenic T cell priming by DCs and upregulation of costimulatory molecules after ex vivo stimulation were attenuated in mice treated with Pam3CSK4+DA-1229, indicating DC tolerance. The relative proportions of CD4+ T cells, CD8+ T cells, B cells, DCs, macrophages and regulatory T cells, and T-helper polarisation were unchanged by treatment with Pam3CSK4+DA-1229. These data demonstrate that a combination of TLR2 tolerisation and DPP4 inhibition can reverse early-onset diabetes in NOD mice. The online version of this article (doi: 10.1007/s00125-012-2723-x) contains peer-reviewed but unedited supplementary material, which is available to authorised users. D.-H. Kim and J.-C. Lee contributed equally to this study. It has been reported that activation of dendritic cells (DCs) by apoptotic beta cells during organogenesis of the pancreas and priming of autoreactive T cells by DCs in the pancreatic lymph nodes (PLNs) are the initial events in the NOD mouse model of type 1 diabetes [1, 2]. We showed that apoptotic beta cells undergoing secondary necrosis, called ‘late apoptotic’ beta cells, can stimulate antigen-presenting cells through Toll-like receptor 2 (TLR2), contributing to the priming of diabetogenic T cells and the development of type 1 diabetes . Recently, we reported that prolonged treatment with a TLR2 agonist inhibits the development of diabetes in NOD mice by inducing TLR2 tolerance . Furthermore, prolonged treatment with a TLR2 agonist protected islet grafts from autoimmune destruction by sensitised T cells. These results suggest that induction of TLR2 tolerance may be able to treat established type 1 diabetes when combined with methods of enhancing beta cell mass, such as islet transplantation. However, the supply of islets for transplantation is limited, precluding widespread application of islet transplantation for the treatment of type 1 diabetes. Strategies with potential beneficial effects on beta cell mass include glucagon-like peptide 1 (GLP-1) agonists [5, 6] or inhibitors of dipeptidyl peptidase 4 (DPP4) [7, 8], which degrades GLP-1 . We have reported that a DPP4 inhibitor ameliorated diabetes induced by streptozotocin (STZ), and that this was attributable an increased beta cell mass . However, DPP4 inhibition alone may not be able to reverse clinically overt type 1 diabetes as established autoimmunity against beta cells would destroy newly formed beta cells. Because DPP4 inhibition could be one of the few currently available methods of increasing beta cell mass, and TLR2 tolerisation could inhibit the autoimmune response against beta cells, we studied the potential therapeutic value of combining TLR2 tolerisation and DPP4 inhibition for the treatment of established type 1 diabetes. Pam3CSK4 was from EMC Microcollections (Tübingen, Germany). DA-1229, a DPP4-selective inhibitor with an IC50 value of 0.9 nmol/l , was provided by Dong-A Pharmaceutical (Yong-In, Korea). All other chemicals were from Sigma (St Louis, MO, USA), unless indicated otherwise. NOD/Lt and BDC2.5/NOD T cell receptor (TCR)-transgenic mice were from Jackson Laboratory (Bar Harbor, ME, USA). The incidence of diabetes in female and male NOD mice was about 70% and 30%, respectively, at 24 weeks of age. BDC2.5 mice were typed by flow cytometry using monoclonal antibodies (Abs) against CD4 and Vβ4 (eBioscience, San Diego, CA, USA). Diabetes was monitored by weekly urine testing and confirmed by two consecutive measurements of non-fasting glucose above 13.9 mmol/l or a single measurement above 16.7 mmol/l. All mice were maintained under specific pathogen-free conditions at the Samsung Medical Center Animal Facility. All animal experiments in this work were performed in accordance with the institutional guidelines. Serum levels of insulin and GLP-1 were measured using ELISA kits (Shibayagi [Gumna, Japan] and ALPCO Diagnostics [Salem, NH, USA], respectively) according to the manufacturers’ recommendations. Diabetogenic T cell priming was assessed as described . Briefly, CD4+ T cells were prepared from the pooled spleens of BDC2.5/NOD mice by the negative-selection method using a CD4+ T cell isolation kit (Miltenyl Biotech, Bergisch Gladbach, Germany) (purity >95%). Carboxyfluorescein diacetate succinimidyl ester (CFSE) (Molecular Probes, Eugene, OR, USA)-labelled BDC2.5 cells (2 × 106) were transferred by tail-vein injection into NOD mice treated with Pam3CSK4 and/or DA-1229 for 3 weeks. The PLNs, mesenteric lymph nodes (MLNs) and spleens were harvested 66 h after transfer, and single-cell suspensions were analysed for CFSE dilution by flow cytometry gated on CD4+ and Vβ4+ cells. To study DC tolerance, mononuclear cells were isolated from the spleens and PLNs of NOD mice treated with Pam3CSK4+DA-1229 for 3 weeks, and incubated with Pam3CSK4 ex vivo for 1 day. The expression of CD80, CD83 and CD86 costimulatory molecules on DCs was determined by flow cytometry gated on CD11c+ cells after incubation with specific Abs (eBioscience). To study DC activation by chronic Pam3CSK4 administration in vivo, splenocytes were freshly isolated from mice treated with Pam3CSK4+DA-1229 for 3 weeks, and the expression of CD80, CD83 and CD86 on DCs was determined as above without ex vivo Pam3CSK4 treatment. The percentage of regulatory T (Treg) cells was analysed by triple-coloured flow cytometry after staining with anti-CD4, -CD25 and -mouse/rat forkhead box P3 (FOXP3) (FJK-16s) Abs, as described [3, 4]. Pancreatic islets were prepared as described  and incubated in 0.05% (wt/vol.) trypsin−0.02% (wt/vol.) EDTA solution at 37°C for 5 min for dissociation into single islet cells and mononuclear cells. Mononuclear cells from the spleens and PLNs (1 × 106) were stimulated with phorbol myristate acetate/ionomycin (BD Biosciences, San Jose, CA, USA)/brefeldin A (eBioscience) for 5 h. After surface staining using anti-CD4 Ab, cells were fixed and permeabilised with Cytofix/Cytoperm (BD Biosciences). Subsequently, cells were stained intracellularly with anti-IFN-γ Ab (eBioscience) together with anti-IL-4 (eBioscience) or -IL-17 Ab (eBioscience). Samples were acquired on a FACSCalibur equipped with CellQuest software (BD Biosciences), and data were analysed using a FlowJo software (Tree Star, Ashland, OR, USA). After fixation and embedding, the pancreases were sectioned to a thickness of 3 μm for haematoxylin and eosin (H&E) staining. For insulitis scoring, more than 30 pancreatic islets from more than three parallel sections were examined per mouse, and the degree of insulitis was graded as described . Islet size was determined using a digital camera, and analysis of each islet was performed using an image analyser. Insulin immunohistochemistry (IHC) was done using guinea pig anti-porcine insulin Ab (DAKO, Carpinteria, CA, USA) as described . Relative beta cell mass was estimated by point counting after insulin IHC . An average of 7,000 points/mouse was counted. BrdU incorporation into beta cells was evaluated 16 h after i.p. injection of 100 mg/kg BrdU by double IHC using anti-insulin and -BrdU Abs (Serotec, Raleigh, NC, USA) . The number of insulin+BrdU+ beta cells was normalised to the total islet area measured using the Axion Vision 4 software (Zeiss, Göttingen, Germany). The number of small beta cell units (beta cell cluster comprising three insulin+ cells at a maximum ) was normalised to the total pancreas area. Relative alpha cell mass was measured by point counting after glucagon IHC using a specific Ab (Cell Signaling, Danvers, MA, USA). Beta/alpha cell mass ratio was calculated after IHC of consecutive sections using respective specific Abs. All values are expressed as the means ± SE. A two-tailed Student’s t test was employed to compare values between two groups. One-way ANOVA was employed to compare values among multiple groups. Once the ANOVA test showed significant differences, the Duncan post hoc test was employed to compare two specific groups. When the Duncan test showed no significant differences (p > 0.05), the two groups were labelled with the same letter over their respective bars. Distribution of islet size was compared between groups using the χ 2 test. The proportion of islets of individual size was compared between groups using the binominal test. p values <0.05 were considered significant. We first studied whether TLR2 tolerance and/or DPP4 inhibition could reverse the model of established type 1 diabetes in NOD mice. Administration of 100 μg Pam3CSK4 i.p. three times a week for 3 weeks, which induces prolonged TLR2 tolerance , to nine female diabetic NOD mice with non-fasting blood glucose levels of 13.9∼19.4 mmol/l failed to restore normoglycaemia in eight mice (normoglycaemia, 11%) (Fig. 1a). This probably occurred because inhibition of autoimmunity alone cannot restore critically reduced beta cell mass. Feeding female diabetic NOD mice with non-fasting blood glucose levels of 13.9∼19.4 mmol/l with 0.3% DA-1229-containing chow also failed to reverse established diabetes in eight of eight mice (normoglycaemia, 0%) (Fig. 1a). This probably occurred because DA-1229 alone cannot inhibit autoimmunity despite its potential beneficial effect on beta cell mass . Moreover, feeding 0.3% DA-1229-containing chow alone did not inhibit the development of diabetes in NOD mice (electronic supplementary material [ESM] Fig. 1), supporting the finding that DA-1229 alone cannot inhibit autoimmunity. In contrast, when female diabetic NOD mice with non-fasting blood glucose levels of 13.9∼19.4 mmol/l were treated with 100 μg Pam3CSK4 administration three times a week for 3 weeks in combination with feeding with 0.3% DA-1229-containing chow, normoglycaemia was achieved in ten of 12 mice (83%) (Fig. 1b). The mean non-fasting blood glucose level was significantly decreased by treatment with Pam3CSK4+DA-1229 for 3 weeks, while the non-fasting blood glucose level was increased or unchanged in diabetic NOD mice untreated for 3 weeks and those treated with either Pam3CSK4 or DA-1229 alone for 3 weeks (Fig. 1c). The non-fasting blood glucose level was further decreased by treatment with Pam3CSK4+DA-1229 for 15 weeks, and was significantly lower compared with the same treatment for 3 weeks (Fig. 1c). Blood glucose levels at 15 weeks could not be determined in untreated diabetic NOD mice or those treated with either Pam3CSK4 or DA-1229 alone because those mice were humanely killed before 15 weeks because of the deterioration in their health. In mice showing amelioration of blood glucose profile after treatment with Pam3CSK4+DA-1229, insulinogenic index (∆insulin15 min/∆glucose15 min), representing beta cell function , was significantly enhanced compared with untreated diabetic NOD mice and those treated with either Pam3CSK4 or DA-1229 alone for 3 weeks, and was not different from that in prediabetic NOD mice (Fig. 1d). In contrast, serum levels of GLP-1 were elevated in diabetic NOD mice treated with Pam3CSK4+DA-1229 and those treated with DA-1229 alone for 3 weeks compared with untreated diabetic NOD mice and those treated with Pam3CSK4 alone for 3 weeks (Fig. 1e). These results suggest that feeding 0.3% DA-1229-containing chow effectively inhibited DPP4 in vivo, regardless of Pam3CSK4 administration or blood glucose profile, and supports the suggestion that GLP-1 elevation alone cannot restore normoglycaemia in diabetic NOD mice. In contrast to these results, we failed to reverse the model of established diabetes in NOD mice with Pam3CSK4+DA-1229 when non-fasting glucose levels were above 19.4 mmol/l (data not shown). This suggests that our method can be applied to established type 1 diabetes when substantial numbers of beta cells remain but not when extensive beta cell damage has already reached a certain threshold. We next studied the morphological changes of pancreatic islets. While diabetic NOD mice treated with Pam3CSK4+DA-1229 for 3 weeks had insulitis, the insulitis score was significantly lower compared with that of untreated diabetic NOD mice and those treated with either Pam3CSK4 or DA-1229 alone for 3 weeks, and was not different from that in 15-week-old prediabetic NOD mice (Fig. 2a, b). The attenuation of the insulitis score by Pam3CSK4+DA-1229 is probably caused by protection of the remaining beta cells and newly formed beta cells from autoimmune destruction (see below), which would reduce the severity of insulitis. 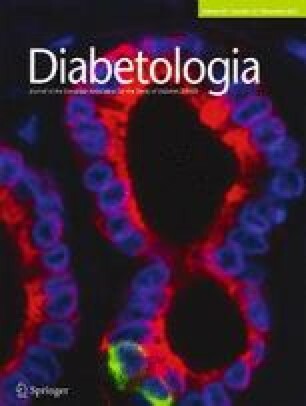 When we examined the distribution of islet size, the percentage of islets with a large size (>6,000 μm2), which account for a major portion of beta cell function, was significantly higher in diabetic NOD mice treated with Pam3CSK4+DA-1229 compared with untreated diabetic NOD mice and was similar to that in prediabetic NOD mice (Fig. 2c). We next measured beta cell mass as an indicator of beta cell function. Insulin IHC followed by point counting showed that beta cell mass was significantly higher in NOD mice treated with Pam3CSK4+DA-1229 for 3 weeks compared with untreated diabetic NOD mice and those treated with DA-1229 alone for 3 weeks, and was not significantly different from that in 15-week-old prediabetic NOD mice (Fig. 3a, b), probably because newly formed beta cells were protected from autoimmune destruction. Beta cell mass in NOD mice treated with Pam3CSK4+DA-1229 for 3 weeks appeared higher compared with diabetic NOD mice treated with Pam3CSK4 alone, but the difference was insignificant, probably because of a large variance (Fig. 3b). To study the mechanism of the increased beta cell mass, we assessed beta cell proliferation that could be upregulated by DPP4 inhibitors [6, 10] by quantifying the number of beta cells incorporating BrdU. The BrdU+ beta cell number was significantly higher in NOD mice treated with Pam3CSK4+DA-1229 for 3 weeks compared with untreated diabetic NOD mice and those treated with either Pam3CSK4 or DA-1229 alone for 3 weeks (Fig. 3d, e). The number of proliferating beta cells in diabetic NOD mice treated with either Pam3CSK4 or DA-1229 alone for 3 weeks was not different from that in untreated diabetic NOD mice (Fig. 3e), probably because both increased beta cell proliferation and protection from autoimmunity are necessary to increase the number of proliferating beta cells. We also studied small beta cell units, comprising three insulin+ cells at a maximum, that could represent beta cell neogenesis . The number of small beta cell units was significantly elevated in NOD mice treated with Pam3CSK4+DA-1229 for 3 weeks compared with untreated diabetic NOD mice and those treated with either Pam3CSK4 or DA-1229 alone for 3 weeks (Fig. 3g, h), again because both increased numbers of small scattered beta cells and their protection from autoimmunity are necessary for an increased number of small beta cell units. Thus, the number of small beta cell units in diabetic NOD mice treated with either Pam3CSK4 or DA-1229 alone for 3 weeks was not different from that in untreated diabetic NOD mice (Fig. 3h). We also studied beta cell changes after treatment for 15 weeks to study the long-term effect. Beta cell mass in diabetic NOD mice treated with Pam3CSK4+DA-1229 for 15 weeks was not different from that in prediabetic 15-week-old NOD mice (Fig. 3c). The numbers of proliferating beta cells and small beta cell units were significantly elevated in diabetic NOD mice treated with Pam3CSK4+DA-1229 for 15 weeks compared with prediabetic NOD mice (Fig. 3f, i), probably because of the elevated GLP-1 levels in treated NOD mice compared with prediabetic NOD mice without DA-1229 administration (Fig. 1d). The numbers of proliferating beta cells and small beta cell units appeared elevated in diabetic NOD mice treated with Pam3CSK4+DA-1229 for 3 weeks compared with prediabetic NOD mice; however, the difference was statistically insignificant (Fig. 3e, h), probably because of the short duration of treatment. We also studied possible changes in alpha cells that could be affected by DPP4 inhibitors  and could influence glucose profile of diabetic mice. Contrary to the widespread conception that beta cells are selectively destroyed in type 1 diabetes, alpha cell mass was significantly reduced in untreated diabetic NOD mice compared with prediabetic NOD mice (ESM Fig. 2a, b). In NOD mice treated with Pam3CSK4+DA-1229 for 3 weeks, alpha cell mass was significantly increased compared with untreated diabetic NOD mice, while only insignificant changes were noted in mice treated with either Pam3CSK4 or DA-1229 alone for 3 weeks (ESM Fig. 2a, b). Beta/alpha cell mass ratio was significantly lower in untreated diabetic NOD mice compared with prediabetic NOD mice, suggesting that beta cells are predominant targets of autoimmunity in NOD mice despite some alpha cell changes occurring in NOD mice (ESM Fig. 2c). The reduced beta/alpha cell mass ratio was normalised by combined treatment with Pam3CSK4+DA-1229 for 3 weeks, but not by treatment with either Pam3CSK4 or DA-1229 alone (ESM Fig. 2c). These results show that DPP4 inhibition alone did not significantly increase alpha cell mass in diabetic NOD mice but did increase it when combined with TLR2 tolerisation, and suggest that the effect of DPP4 inhibition on alpha cell mass is secondary to beta cell changes, as alpha cells are not major targets of autoimmunity and are not likely to be affected by the changes of immune function associated with TLR2 tolerisation. We next investigated whether the increased beta cell mass in diabetic NOD mice treated with Pam3CSK4+DA-1229 is accompanied by TLR2 tolerance of DCs. When we measured the proliferation of infused BDC2.5 CD4+ T cells harbouring transgene-encoded Tcr-α/Tcr-β (also known as Tcra/Tcrb) genes derived from a diabetogenic CD4+ T cell clone reflecting autoreactive T cell priming by DCs , successive dilutions of the CFSE label in BDC2.5 CD4+ T cells were observed in the PLNs (Fig. 4a, b), but not in the MLNs or spleens of prediabetic NOD mice (ESM Fig. 3), showing proliferation of diabetogenic CD4+ T cells specifically in the PLNs as reported . A similar pattern of BDC2.5 CD4+ T cell proliferation was observed in the PLNs, MLNs and spleens of diabetic NOD mice treated with DA-1229 alone (Fig. 4a, b; ESM Fig. 3), suggesting that DPP4 inhibition does not affect diabetogenic T cell priming by DCs. In NOD mice treated with Pam3CSK4 alone or Pam3CSK4+DA-1229 combination, the proliferation of BDC2.5 CD4+ T cells in the PLNs was significantly reduced compared with that in prediabetic NOD mice (Fig. 4a, b). These results suggest that TLR2 tolerance of DCs was induced in NOD mice treated with Pam3CSK4+DA-1229, independent of DA-1229 , and protected the remaining beta cells and new beta cells from autoimmune destruction, leading to the restoration of normoglycaemia in diabetic NOD mice. We further studied the mechanism of DC tolerance in mice treated with Pam3CSK4+DA-1229. When lymphocytes from the spleens or PLNs were incubated with 100 ng/ml Pam3CSK4 ex vivo for 1 day, the increases in the expression level of costimulatory molecules such as CD80, CD83 or CD86 with ex vivo Pam3CSK4 treatment were less pronounced in mice treated with Pam3CSK4+DA-1229 in vivo for 3 weeks compared with prediabetic NOD mice, as reflected by significantly lower fold increases in the mean fluorescence intensities (MFIs) in the treated mice compared with the prediabetic NOD mice (Fig. 4c, d). However, the expression of CD80, CD83 or CD86 in DCs from the spleens or PLNs of NOD mice treated with Pam3CSK4+DA-1229 in vivo but without further Pam3CSK4 treatment ex vivo was not different from that in DCs of prediabetic NOD mice (Fig. 4e, f), suggesting that prolonged treatment with Pam3CSK4+DA-1229 itself does not induce DC activation, similar to the findings in NOD mice treated with Pam3CSK4 alone . We next studied the possible changes in the immunological profile of NOD mice treated with Pam3CSK4+DA-1229. The relative proportions of CD4+ and CD8+ T cells, B220+ B cells, CD11c+ DCs and F4/80+CD11b+ macrophages in the spleen, MLNs and PLNs were not significantly different between NOD mice treated with Pam3CSK4+DA-1229 for 3 weeks and 15-week-old prediabetic NOD mice (ESM Fig. 4). The proportion of CD4+FOXP3+ Treg cells in the spleen, PLNs and pancreatic islets and the MFI of CD25 on CD4+FOXP3+ Treg cells, reflecting their peripheral suppressive function , were also not significantly different between NOD mice treated with Pam3CSK4+DA-1229 and prediabetic NOD mice (Fig. 5a, b), which is similar to the findings in NOD mice treated with Pam3CSK4 alone . The proportions of CD4+IFN-γ+ Th1 cells, CD4+IL-4+ Th2 cells or CD4+IL-17+ Th17 cells in the spleens and PLNs of NOD mice treated with Pam3CSK4+DA-1229 were also not different from those in prediabetic NOD mice (Fig. 5c, d), again similar to the findings in NOD mice treated with Pam3CSK4 alone . These results suggest that reversal of diabetes by Pam3CSK4+DA-1229 is unrelated to the alteration of Treg cells or Th1/Th2/Th17 skewing. For the treatment of established type 1 diabetes, first, autoimmunity against beta cells should be inhibited, and, second, critically reduced beta cell mass should be replenished. Both goals are not easy to achieve using the techniques currently available for patients. Numerous immunological methods have been employed to inhibit autoimmune responses to beta cells in human or animal models of type 1 diabetes [17, 18, 19, 20, 21, 22, 23, 24, 25, 26, 27]. However, immunological methods alone were largely unsuccessful in the treatment of clinically overt type 1 diabetes, probably because of the already significantly compromised beta cell mass. Thus, strategies to replenish the reduced beta cell mass will be required for the treatment of type 1 diabetes patients. Current methods of increasing beta cell mass are generally not satisfactory. Pancreas or islet transplantation could be the most effective method to increase beta cell mass if further auto- and allo-immune destruction can be suppressed. However, the supply of pancreases and islets from humans is limited. The use of tissue from non-human sources for xenotransplantation presents several obstacles, such as endogenous virus or hyperacute rejection. Recently, derivation of beta cells from induced pleuripotential stem cells (iPSs) has emerged as a promising technology to obviate the ethical problems associated with embryonic stem cells and alloimmune responses . However, safety issues such as teratoma formation and low reprogramming efficiency preclude clinical application of iPS-derived beta cell technology. Other methods increasing compromised beta cell mass comprise diverse pharmacological agents or hormones, including GLP-1 and DPP4 inhibitors [29, 30, 31, 32, 33, 34, 35, 36]. In mice treated with Pam3CSK4+DA-1229, a beta cell-trophic effect of DPP4 inhibition was demonstrated by increased numbers of proliferating beta cells and small beta cell units. On the other hand, only a few apoptotic TUNEL+ beta cells were found in the pancreatic islets of prediabetic NOD mice, and this was unaffected by Pam3CSK4 and/or DA-1229 (data not shown). While small beta cell units have been regarded as newly formed beta cells, representing beta cell neogenesis [8, 14], a recent paper argued against such a theory . Progenitor cell recruitment and lineage tracing were also not assessed in this investigation. Hence, our results may not be sufficient to conclude that Pam3CSK4+DA-1229 increases beta cell neogenesis. While a suppressive effect of DPP4 inhibitors on serum glucagon level or glucagon secretion from alpha cells has been reported [10, 38], the effect of DPP4 inhibition on alpha cell mass has not been widely studied. Our results showing diminished alpha cell mass in diabetic NOD mice are consistent with a recent paper reporting reduced alpha cell mass in animal models of type 1 diabetes . However, the decrement in alpha cell mass was lower than that in beta cells , which is consistent with the suppressed beta/alpha cell mass ratio in this study. The decrease in alpha cell mass in NOD mice could be caused by a paucity of local factors from beta cells necessary for alpha cell survival . Our results are different from previous reports showing that DPP4 inhibitors attenuated the increase of alpha cell mass in diabetes induced by STZ and a high-fat diet [7, 38], and suggest that alpha cell changes associated with DPP4 inhibition vary depending on the experimental models or methods. It was reported that DPP4 inhibitors, even without immune modulators, could reverse new-onset diabetes of NOD mice . This effect has been attributed to the inhibition of CD26 (DPP4) and modulation of T cell migration [33, 36, 40]. However, we did not observe significant effects of DPP4 inhibition in the model of established type 1 diabetes. Furthermore, DA-1229 alone did not prevent the development of diabetes in NOD mice (ESM Fig. 1), which is in contrast to the prevention of diabetes in NOD mice by Pam3CSK4 alone . These results are consistent with the lack of DC tolerance in the PLNs of NOD mice treated with DA-1229 alone. The immunological mechanism underlying the different results is not clear, and could be ascribed to disparate effects of different DPP4 inhibitors. However, it is generally agreed that DPP4 inhibitors do not have significant immunological effects [41, 42]. To achieve significant inhibition of autoimmune process, other immunological measures will probably be necessary in addition to DPP4 inhibitors. While not sufficient alone, immune modulation will be necessary for the treatment of clinically overt type 1 diabetes because remaining or new beta cells should be protected from autoimmune attack. TLR2 tolerance of DCs in NOD mice treated with Pam3CSK4+DA-1229 is essentially identical to that in NOD mice protected from the development of diabetes by Pam3CSK4 . While we showed that Treg cell change is not involved in the reversal of the model of established type 1 diabetes in NOD mice by Pam3CSK4+DA-1229, a recent paper reported that two administrations of Pam3CSK4 with a 5 day interval increased Treg cell number and ameliorated diabetes in NOD mice . The different immunological impact of Pam3CSK4 administration could be attributable to the different methods of administration. Together, our results show that reversal of established diabetes is possible with a combination of TLR2 tolerisation and DPP4 inhibition, and suggest that DPP4 inhibitors could replace islet transplantation in this regard. The DPP4 inhibitor is one of the most popular drugs for the management of type 2 diabetes in the clinic. Pam3CSK4 has also been used without specific side effects for the vaccination of cattle  and experimental animals [45, 46] and also in patients . Thus, the method described here may provide a novel modality that could be applied in the clinic for the treatment of established type 1 diabetes without the issues associated with islet transplantation. DA-1229 was kindly provided by H.-J. Kim at Dong-A Pharmaceutical. We are grateful to E. Lee (Samsung Medical Center, Seoul, Korea) for assistance with English editing. This study was supported by the Bio Research & Development Program (2008-04090) and the Korea Healthcare Technology Research & Development Project, Ministry for Health, Welfare & Family Affairs, Korea (A080967). M.-S. Lee is the recipient of a Global Research Laboratory Grant (K21004000003-10A0500-00310) and Bio & Medical Technology Development Program (20110019335) of the National Research Foundation of Korea. All authors contributed to the conception and design, or analysis and interpretation of data, drafting and revision of the article. D-HK and J-CL particularly contributed to the acquisition of experiment data. M-KL, K-WK and M-SL contributed to the design of the experiments, analysis of data and drafting of the manuscript, in particular. M-SL contributed to the initial conception of the study and to the supervision of all experiments throughout the study. All authors have approved the final version of the manuscript.